OK, I've seen the videos and read the guides and I'm begining to get psyched up for the big day! What's the smaller (approx 10mm diameter) black 'o' ring for? OK it's the drive gear 'o' ring but where does it go? In one of the vids in the 'How to' section the guy is cleaning the mating faces up with emery paper - what grade should I use so as not to make scratches too deep? The small ring is #10 I think. Note picture shows the old-style cast impeller. Cleaning mating surfaces - I would never use emery, you really don't want to scratch those mating surfaces at all. If you can't find a solvent for what's on there, safest is to make a scraper of soft metal (soft aluminium or brass) or even plastic and go at it real gently. I confess to using a knife, but I get it over at a really acute angle so that the edge isn't on the surface I'm cleaning. A far as sealant is concerned use as little as possible. A very thin film is enough, otherwise you are likely to block the oil pressure relief channel. No sealant for o-rings, unless it is loose enough to fall out as you assemble the pumps. This and this link could become useful. Gerry, Inge, thanks really useful info. Think I have a pretty complete plan now. yep, got it right captain .....the driebond works excellently for this job (3 bond) and verry conservative with the application of the goo . make sure you have a few 12mm id washers to pull the pump shaft through the water seal . 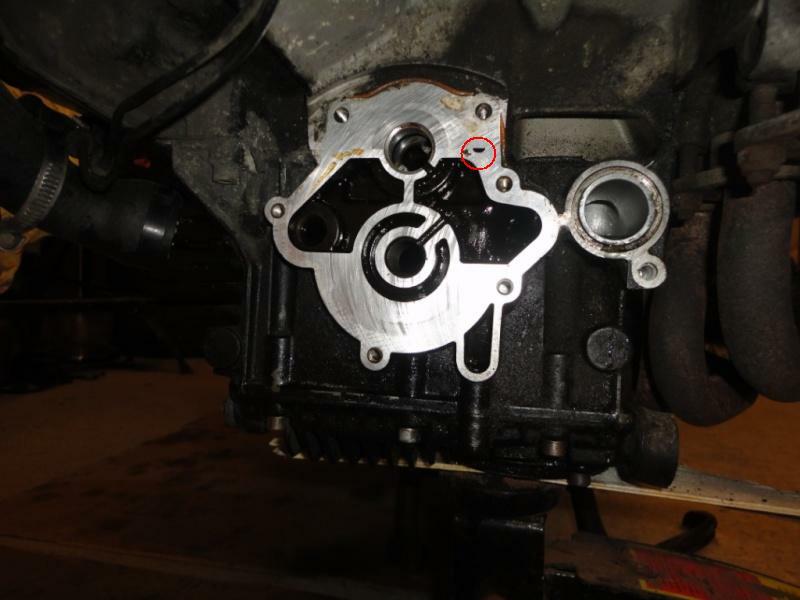 I also did my oil / water pump earlier this year without a problem. I found a video on youtube which goes throught the process (don't have the link but it should be easy to find). Give it a go it was not very difficult. OK so I have some blue hylomar - but this won't do right? Please coud someone clarify this is stuff I should use before I buy it? Thanks Guys just want to get everything ready so I won't be tempted to bodge it! I once used Hylomar on the pump joint and it leaked like a sieve, re-did it with 3 Bond and everything was back to normal. I was so impressed, that when I fitted a new big end in the Vincent last year, I did all the joints with 3 Bond and that motor is bone dry (on the outside). I should really carry an oil can to squirt a few drops under the bike when I park, to make it look original. Cover plate bolts are corroded. All out except for two. One came out with a torx bit hammered in to it, the other has had the same treatment but won't budge. Tried a larger torx and a flathead bit but no joy. it's now looking a pretty messy allen bolt. If it was one of the ones that were round the edge I think it could get in out but it's in the middle of the plate so not much head protruding. No welding gear here, might have to get a local garage to come out. Anything else worth trying (even if it meant sacrificing the cover it might be cheaper than getting the garage out)? You`re not the first one in here, with this problem. Drill the head off the screw, use a self locking plier and some heat to get the remaining stud off. Thanks Inge. Will do as you say. Took your advice and got the sucker - big thanks Inge. All the rest came off easy so have the pump on the bench now. Well, nothing that hasn't been seen before but what the hell, here's some pics so far. I followed the advice to tip the bike backwards to reduce the amount of oil leakage when you remove the pump (without draining the oil). With the bike on the mainstand I jacked up as far as I could go beneath the sump with a trolley jack before the bike became unstable. I then let teh air out of the back tyre to gain another centimetre or so. I reckon about half a litre came out (level has been just below the 'dot' in the sight glass). Here are the bits that didn't make it (on top of the pump cover), The flat brass top of the connection on the water temp sensor also came off so at £30 for a new one I might attempt soldering the wire to the stump for now. This is what the old seals look like. The spring and a bit of rubber came out of the water side of the pump, the rest was gentely pushed through by tapping through with an upside down 6" nail with my 'special' hammer described below. Started the cleaning up process. Need to wait for new bolts and gasket/threadlock to arrive in the post so no hurry. I think all of the old seals are out - but not 100% sure! Looking good actually Dave, I'm interested becuase I'll be doing it in the spring I reckon. Good work that man. Beware, so don`t clog this hole with sealant when you put things back together....as it is the return passage from the pressure relief valve. That all looks pretty good. Mating surfaces are in good shape. Thanks Gerry, yes no horror stories so far! Here's a question; the bolts should be torqued to 5-6 ft/lbs. Neither of my torque wrenches goes this low so am looking to buy one. At this time of year it needs to be cheap. On Ebay there are TUV approved 3/8" drive with 5-80 ft/lb range for about £20. TUV approved appears to be a German/EU standard. Worth having or a waste of money? but it might get a bit expensive. Even with a cheap torque wrench its easy to check it at the setting you need. Torque = Force x Radius. Set the wrench to 6ftlbs and clamp the drive in a vice with the wrench horizontal. Take a weight of 6lbs and hang it on the wrench 1ft from the drive. The torque wrench should just click over. If its easier 3lbs at 2ft from the driver also gives 6 ftlbs. Thanks Gerry, some good info. Yes Snap-on are well rated but as you say by the time you add the frenzied bidding at the end and the postage it'll go for too much. Like the idea of testing it - never even occured to me! Well work has progressed this morning afteer a week's delay. I have fitted the oila nd water seals and refitted the shaft (pics will follow 88!). One immediate query/observation. In the photo you can see two different styles of spacer. The spacer and washer on the left are the old ones, the new spacer (with no washer) is on the right. I can only imagine that the water seal design has changed as the only combination of spacer and washer that now provides clearance for the impellor is using the new spacer (without the old washer). Can anyone confirm this is the case? Here is the diagram from the BMW 16 valve workshop manual. the washer is number 7 and the spacer is also clearly shown. The washer is actually part of the old seal (it has some rubbery stuff moulded to it) so it doesn't really come into the equasion. use the small spacer with the spigot facing out to centre the impeller. Fitting the oil seal was easy. A lick of grease around it, and driven in to a nice, clean housing with a rubber hammer and using a socket the same diameter as the outside of the seal. This is it fitted. WAITING FOR IMAGE WITH OIL SEAL THE RIGHT WAY AROUND!!! I squeezed in the water seal in with a piece of threaded bar with a nut and washer on the oil side and a brass curtain pole cap and nut on the other! The curtain pole end was ideal as it sat over the fragile, sprung part of the water seal, right on the flange that needs to be pushed flush with the housing. It was a matter then of tightening the nuts until it was squeezed home. The shaft was a little pitted and corroded; I cleaned it up with some 800 grade. You can see in red what I guess is pitting near the water seal contact points; this wasn't leaking so should be OK. the oil seal contact points I would guess are in yellow - two polished slight groves you can feel with your nail. Once reassembled we'll see if a new seal sorts the oil leak or if the grooves have worn to a point the shaft needs replacing. Putting the shaft in through seals was easy using washers and the new spacer and this is well described elsewhere. Don't like to disapoint you but that oil seal is in backwards. The side with the tension spring on the lip goes to the oil pressure side and that is unfortunately the other way round. If you are very careful you may be able to get the coolant seal out without damaging it. You will need to use a press because if you hit it with a hammer you mat crack or shatter the ceramic coolant seal, bit like hitting the wifes fine china tea cups with a hammer. yep rick is right ...the domed part of the oil seal should be towards the front..
No worries, I've probably got the next 6 months to get it right Snow and ice this week not a good omen. Hmmm. Not sure how that shaft will come out of those nice tight new seals. Just before things get serious - why does it matter which way round the oil seal is? @MT350Explorer wrote: Hmmm. Not sure how that shaft will come out of those nice tight new seals. Because a seal is designed to have the oil pressure compressing the lip on the shaft. When installed the wrong way, only the dust lip seals the oil. Thanks CF, I was clutching at straws there. Thanks Klompy! Just wait until the next episode, scheduled for Christmas day evening after three bottles of wine - what can possible go wrong?! Bit of bummer Dave, but better to find out this way, You're still saving a small fortune over replacing the pump or paying a workshop to do it. @MT350Explorer wrote: Thanks CF, I was clutching at straws there. 88KE wrote: Bit of bummer Dave, but better to find out this way, You're still saving a small fortune over replacing the pump or paying a workshop to do it. Yeah - hey and I'm learning something so not really sweating it . The daft thing is that I put the oil seal in last week only after looking at various links and videos and stuff to make sure it was the right way round but by I guess my brain shortcircuited! Thanks club-c, maybe we can get a club badge made up for those that have tried and screwed it up? Maybe a series of badges for jobs that have claimed peoples sanity? In any case, it's better to catch the error now rather than breaking down in the middle of nowhere. Thanks Bert. That one was painful for Halo but a great result in the end.